Around this time every year we take our kids off to our local garden center to pick out a small Christmas tree for the corner of their bedroom. I did the same growing up and I can remember the excitement of choosing my very own tree, opening my special box of decorations and falling asleep each night bathed in the warm glow of fairy lights – so cozy. It’s one of our favourite Christmas traditions and each year we add a few new decorations to the kids little box of treasures. Some are bought and given as advent or stocking gifts but most of them are handmade by the children, either at home or at school. It’s so fun to see how different they all are, each one sparking memories of happy craft sessions around our kitchen table or at school with favourite teachers. They are definitely some of our most treasured ornaments. Last year we made these super easy ribbon Christmas trees and they turned out so great that we decided to make a few more for friends this year. They only require a few simple supplies, most of which you will probably have lying around the house and garden and it’s straightforward enough that most age groups can have a go. 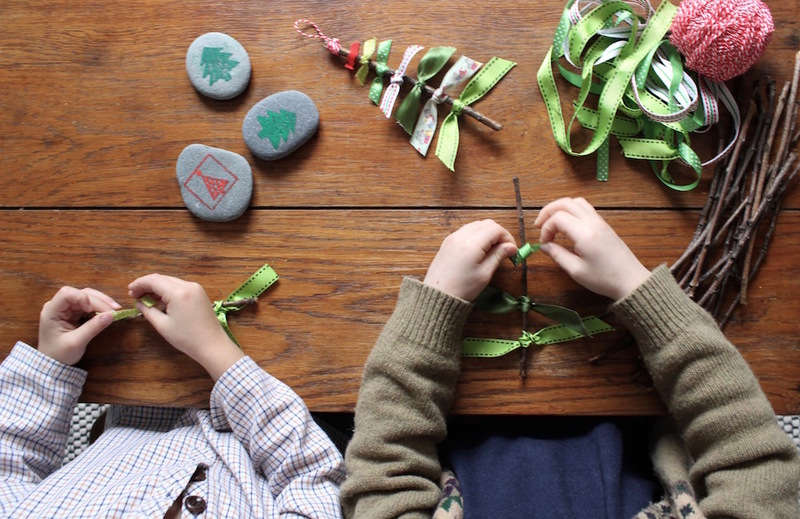 Plus it’s a great exercise for younger children to practice tying knots. 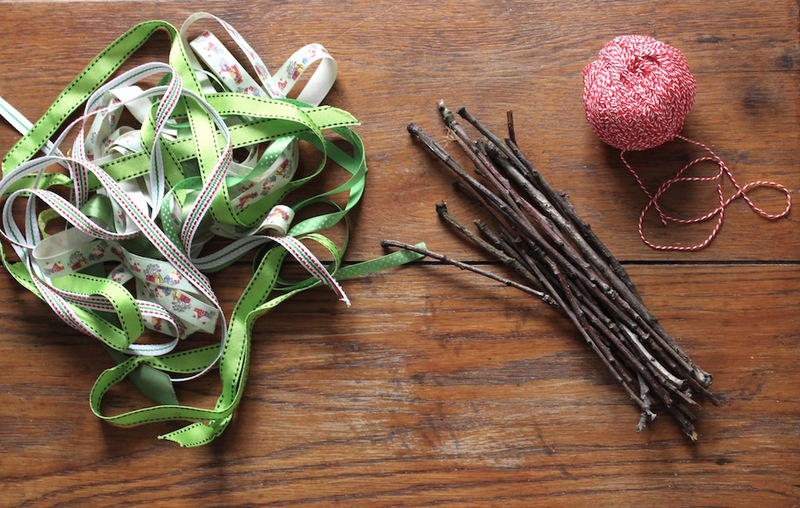 Cut enough strips of ribbon to stack along the length of your stick – leave strips long enough for little hands to tie, you can trim later. Start at the bottom of the stick and work your way up to the top tying loose knots around the stick. Leave a few centimeters at the top of the stick for your hanging loop. When all the ribbons are in position adjust the ribbons so that they lay straight and flat, then tighten the knots. 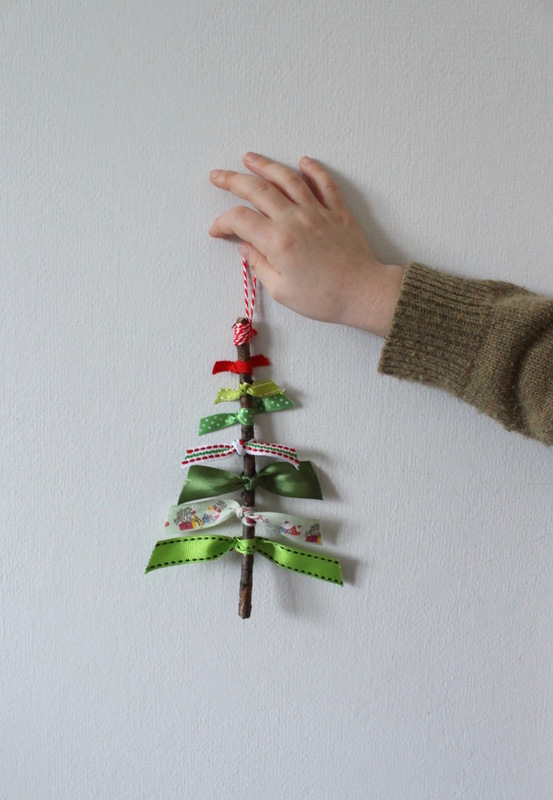 Trim the edges of the ribbons to create a Christmas tree shape. Starting at the bottom, cut the edges at an angle gradually making each row shorter until you have a fairly symmetrical triangular shape. Tie a loop of string or twine around the top of the stick to hang your ornament. 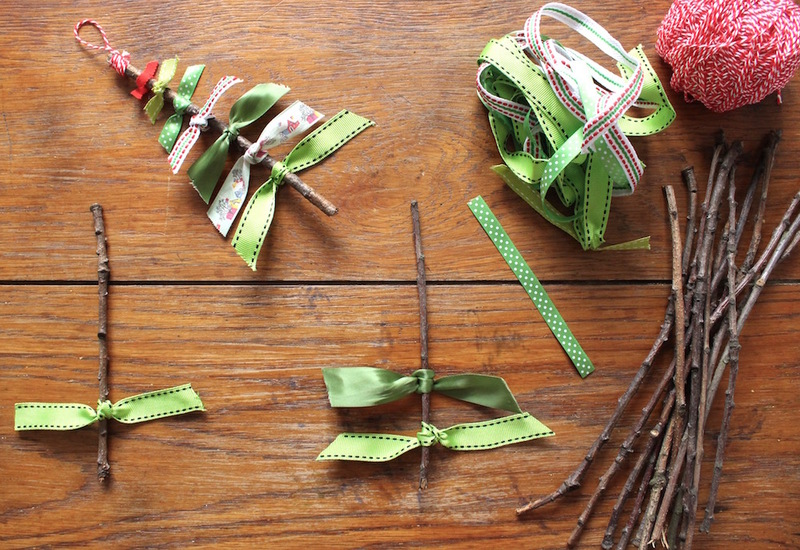 So simple and pretty and a great way to recycle all those old Christmas ribbons from last year. Lovely ornament, you inspired me for my Christmas table placeholders. Thank you for sharing this Kate. Happy Christmas!